I have sand in my hair. It is true I was down to the beach. But that's not how sand came to be in my hair. It was dusted on the top of my head by a Lama, right from the green sandiness of Tara at the centre of her sand mandala. And if that wasn't enough we again received a slurp of blessings in the form of a dark sweet water, the origins of which had been prayed upon by the Dalai Lama and other auspicious monks. Today was the final day for the Green Tara sand mandala that Lama Tenzin Tsundun began on Monday. Today was the day of letting go and a fine array of Salt Spring folks crowded into the gallery for the prayers and blessings. Together we watched flower petals from our gardens tossed in the air and finally a dorje drawn through a weeks worth of careful work to create a slightly grey pile of sand. There were babies breastfeeding and toddlers sitting in laps eating juicy plums and Dorje the dog sniffing the wonderful assortment of shoes mixed with the aroma of incense. There was chanting and a Dharma talk and five lovely Dakinis singing in Tibetan while one played the guitar, a tune composed in a day by a young woman who disappeared after the song as quickly as she'd arrived Wednesday morning. The altar overflowed with lush collections of summer flowers, fat yellow plums, cherries, tofu, gummy bears and chocolate dipped cookies. The day was mixed with a little morning fog and some afternoon sunshine. For the grand finale we followed Lama down to the beach, a rag tag bunch; baby strollers, a blue glass vase of sand and a prayer flag string of coloured outfits trailing down the road, surprising cars rushing to the ferry. A young man in a straw cowboy hat volunteered to row Lama out into the bay to release the sand. Later someone pointed out that in a very Salt Spring sort of way the boat was named "Clara T". Today was all about letting go. There are so many things we can let go of on so many levels. Lama talked about letting go of fear, that not only is this is a gift to our bodies but fear holds us back from experiencing life as it is. We can let go of our busyness and just be. He reminded us in a very concrete way how to go about this. "Sit in the morning," he said after you brush your teeth. Maybe just for 5 or 10 minutes and think what am I doing with this life?" He reminded us to go out into the day with a positive attitude and a compassionate heart. At the end of the day he suggested, "look at how the day went, some things were good, maybe some things not so good." Perhaps recite a little prayer or mantra for the things that you did that were not so good, a purification, and then let them go." 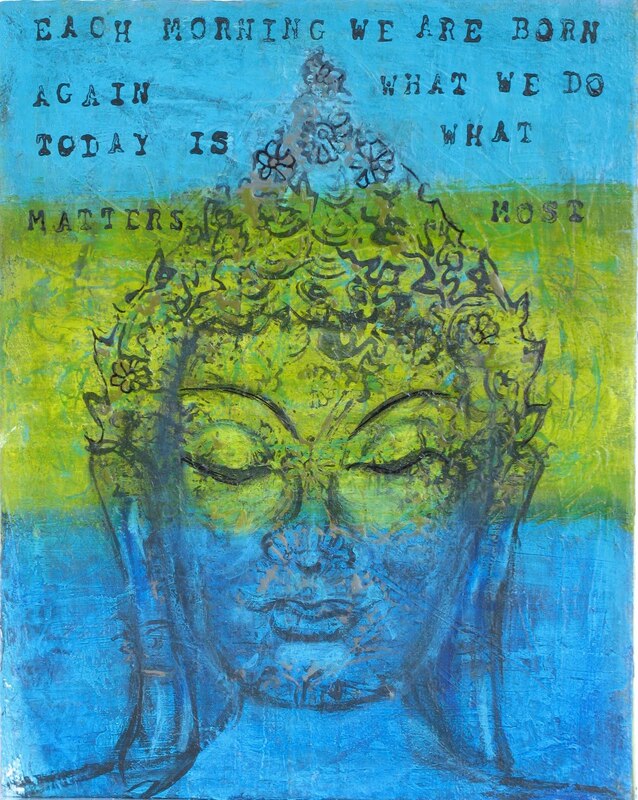 And so the painting above reminds us in words attributed to the Buddha, "Each day we are born again. What we do today is what matters most." 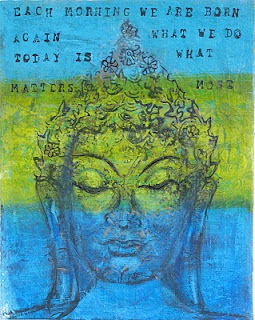 This little painting uses an old wooden stamp from Nepal to create the shape of the Buddha's head. I was enamored with the shape of it when I found it at Kebe & Fast's traveling sale last month. May you let go of what troubles you and may you let go of something you love. One day we will be called upon to let go of it all. May you savour your precious human life while you have it. I could just see it all...children, fruit, flower petals, Lama and blessings. What a beautiful sight to behold. Letting go...I like that...a true wisdom. The painting is so elegant and serene. And the entire post is one I would simply be happy 'to sit' with ...you have such a gift of laying out the letters like a walking meditation. "There were babies breastfeeding and toddlers sitting in laps eating juicy plums and Dorje the dog sniffing the wonderful assortment of shoes mixed with the aroma of incense." Over the years I've been in several of these 'processions to the river' and the sand in your hair is such a fitting 'take away' isn't it? I bow in your direction. Wonderful and excellent Great post. Oh! yes. Fear and busyness. These are two biggies for me. A constant process of letting go of these two, and of trusting more just what is, all of it. Thanks everyone for stopping by and sharing in the wonderful energy of Green Tara!